Touch someone you care for with these light and silky-smooth blends of Aromatic Massage Oils. Fortified with skin-nourishing Vitamin E and artfully blended with pure essential oils, each of the five scented massage oils reveals an enticing fragrance and imparts a powerful effect on mind, body and spirit. 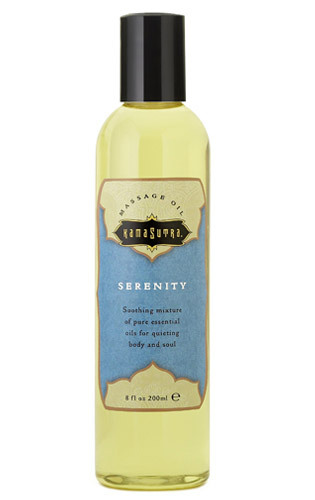 Serentiy contains a soothing mixture of pure essential oils for quieting the body and soul. Essential oils include: cedar, sweet marjoram, neroli, orange, tangerine and lavender. Drizzle your favorite scented massage oil onto your hands or directly onto your lover's body. Gently caress into the body and enjoy the aromatherapeutic scent and the light, silky texture. Note: Aromatic Massage Oils can also be used in bath water for beautifully scented, soft skin.